Feelings: There are several restaurants in Queens that serve Indian Chinese cuisine, known as Hakka. I was completely unfamiliar with this cuisine until Sekita recommended to have our monthly outing at Tangra Masala in Elmhurst. Honestly, I have never had a bad meal in Elmhurst, so any opportunity to dine in the neighborhood sounded great to me. If I wasn't so vain and not completely obsessed with fashion, brown stones and cute shops, I would move there in a second. Tangra Masala is a small no nonsense neighborhood eatery that, even on this Tuesday night, was packed with locals. Although they do not take reservations, they kindly kept two tables for us. 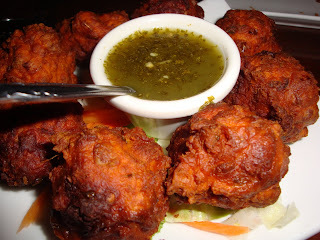 The service was helpful and friendly, and they gave us a free appetizer of tasty fish pakora ($5.95) for each table. MGill thought it was kind of funny that that their menu was broken down to three different preparations: the hot and garlic Tangra Masala, the brown and ginger Manchurian, and the yellow curry powder Singapore. "Maybe there is more subtlety than that, but this was how it seemed and how the waiter broke it down for us when we asked," he added. If I can sum up the flavor of Indian Chinese cuisine, it would be HOT. Most of the dishes on the menu have the "hot & spicy" sign next to them. BLee appropriately said, "Although the dishes were spicy, I definitely don't think that detracts from the restaurant at all. I think it makes it more interesting!" The waitstaff saw us being delirious from all the heat, and he came around with a pitcher of iced water and jokingly said they would make it less spicy next time. Most of the restaurants outside of Queens tend to compromise of their authentic flavors, so we were appreciative that they did not discriminate and served their authentic flavors to us. Pretty much everyone ordered their famous lollipop chicken ($5.95), an addictive crispy appetizer that came with spicy mayo sauce that resembled Calexico's infamous Crack Sauce. 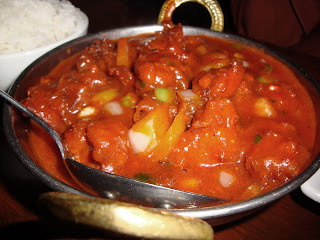 "The best Gobi Manchurian I've had in the city is at Dhaba on Lex," MGill said, but he also liked the dish at Tangra. Many dishes came with "dry" or "wet" (with gravy), but he thought in the wet vs dry debate, it depended on the dish. "Our gobi was wet, and that worked for cauliflower, but I like the dry chicken Manchurian as it was." If you are a light weight when it comes to spicy food, they also have plenty of mildly flavored dishes. 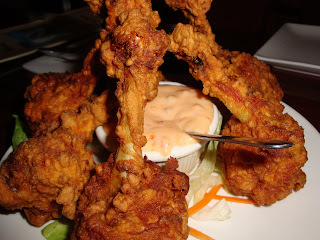 "I liked my chicken and broccoli, and I can't say it was anything special, but the chicken was quite tender," said JBH. 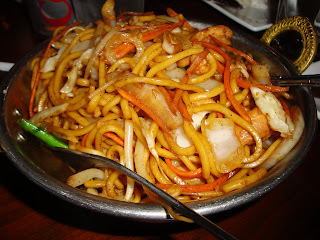 I do not handle spicy food very well, but I bravely chowed down my vegetable Manchurian chow mein ($6.95) without foreseeing what was ahead. It was chewy and full of bold flavor, and I enjoyed the every bite. However, about three minutes later, my entire body was on fire and every pore releasing greasy hot sweat. It was similar to the feeling of getting drunk for the first time. Ironically, this restaurant does not serve alcohol or allow BYOB. But when you get this much heat, all you need is a nice glass of iced water...or two...or three. I haven't been, but you should try the one on Queens Blvd. next time then. Have to admit, might not be my cup of tea since the dishes are so spiced up. I prefer lighter flavor. Woo! I haven't picked it up yet. I love Chopstick magazine..